A credit report contains information about your credit, bill payment history, and the status of your credit accounts. This information includes how often you make payments on time, how much credit you have, how much credit you have available, how much credit you are using, and whether a debt collector is collecting on money you owe. Credit reports can also contain rental payment information and information on your utilities payments. Certain public records, such as liens, judgments, and bankruptcies, are also included in your credit report. You are entitled by law to a free copy of your credit report from each of the reporting agencies once a year. You may request your free credit report at www.annualcreditreport.com. Lenders use your credit report to help them decide if they will loan you money, what interest rates they will offer you, or to determine whether you continue to meet the terms of the account. Insurance companies may pull the credit report of an applicant who has applied for a large amount of life insurance. 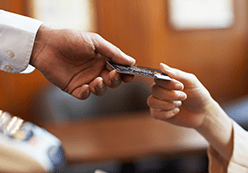 Employers may use credit reports when making employment decisions about you. A credit score is a three-digit number calculated from data on your credit report. A complex algorithm called a scoring model is used to compute your credit score. FICO® is the most popular credit scoring provider. FICO® scores are available through the three consumer credit reporting agencies. Your credit score may differ between reporting agencies. While your credit report is available to you without cost, you typically pay a fee to get your credit score. Have you been making your payments on time? Lenders like to see this. Owing a lot doesn’t make you a high-risk borrower, but lower amounts of debt are viewed more favorably by lenders. In general, the longer your credit history, the better your score. Is all your debt on credit cards? Lenders like to see a mix of credit cards, retail accounts, installment loans, finance company accounts and mortgage loans. If you have opened several credit accounts in a short period of time, this is generally regarded as posing a higher risk to lenders. How Do I Evaluate My Credit Score? Late payments. It takes about 24 months to restore credit from late payments. Derogatory information. This includes bankruptcies, foreclosures and tax liens. Credit cards with no available credit. Maxed-out cards can lower your score. Opening multiple new accounts in a short period of time. Closing revolving accounts with long history. Try not to do this. Reducing your credit history can lower your credit score. Lowering credit limits on existing revolving credit lines. Try not to do this. It may increase your balance-to-available credit ratio which will, in turn, lower your credit score.